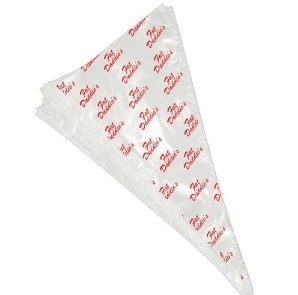 Our heavy duty pastry bag helps you save time by eliminating clean-up problems. The .0042" polyethylene material allows these bags to be used with hot or cold food products. The soft and super-flexible material ensures comfort while using and prevents slipping in your hand. Easy to use, just cut the end of the bag, drop in the decorating tube of your choice, fill, and begin using! Available in 2 sizes and many packaging options to fit any need.